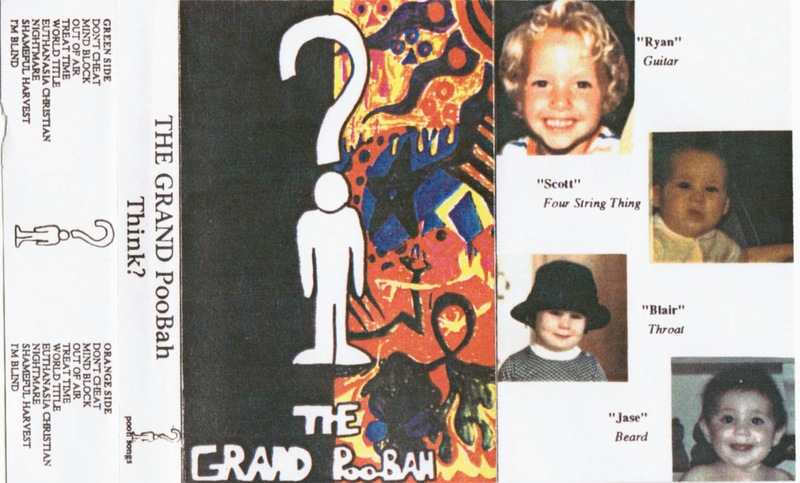 Calgary Cassette Preservation Society: CCPS Miscellany: Grand PooBah - Think? We received a pair of tapes in the mail last week, thanks to Kristian Basaraba. First up is this one, which sounds like the sort of all ages punk that would have kept the kids at the Calgary Multicultural Centre hopping. Or something. Kristian says that they were a "Fort Saskatchewan/Edmonton band with some members going on to form Broken Nose with members of Drool". I've been looking for this tape forever! Thank you so much! Holy crap! I remember these guys played in Nelson, B.C. at the Eagles Hall in '92 or '93. They were all underage and their parents drove them up in a minivan. First time I'd ever seen a band climb out of a minivan. They also threw out a couple garbage bags worth of Old Dutch popcorn twists into the crowd for some reason, didn't bother to help clean up afterwards, and was the end of shows at the Eagles.